The newly built office building “6 Bevis Marks” is located right behind the renowned “Gherkin” in the heart of the City of London. 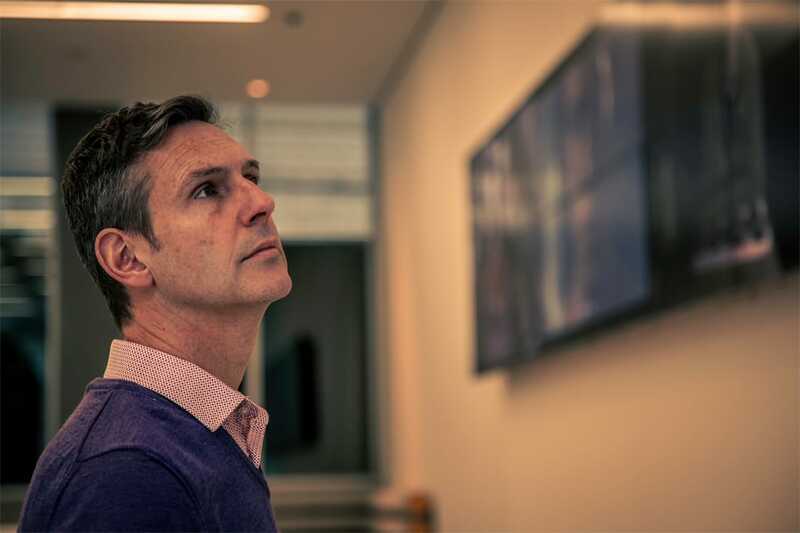 In order to impress people entering the building and also showing its link with the new digital age, the architects of the building, Fletcher Priest, were looking for a video wall that simply wows people and turns their heads. The main reason for this huge video wall was to use it for art exhibitions and other art-related events throughout the year. 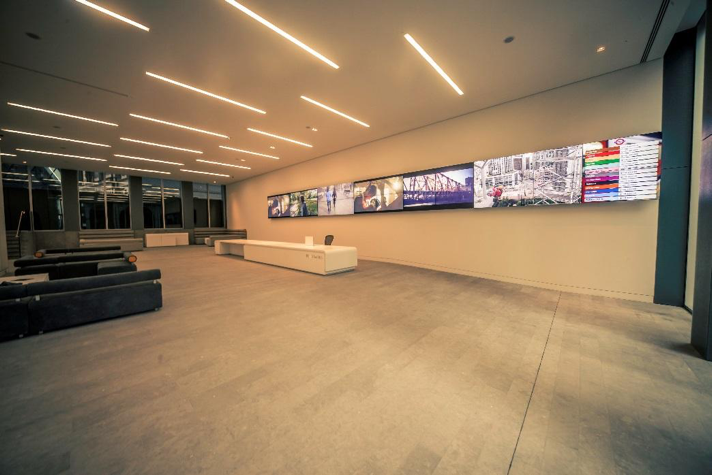 It was important for the client to be able to show different content and control the sources and the video wall content in a simple, straightforward way. 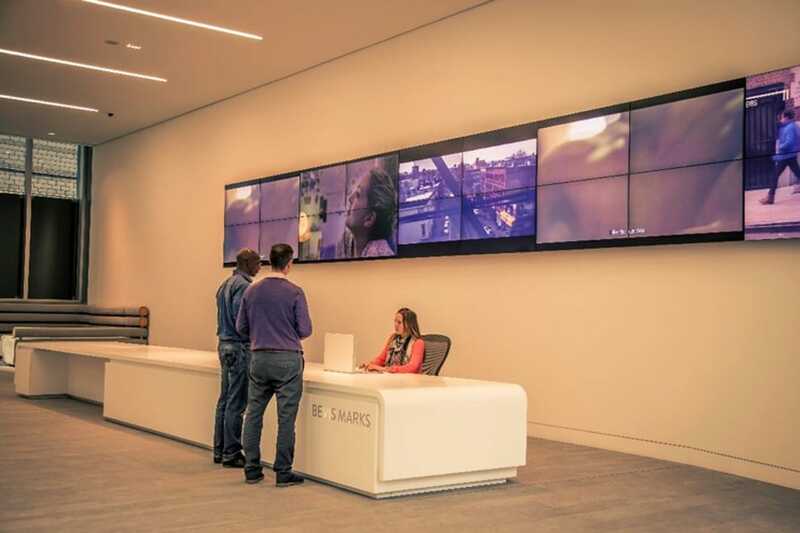 NEC gave us the lead for this project through Fletcher Priest and we designed and installed a 13x2 video wall consisting of 26 single 55” screens that are being managed by a Matrox processor. An iPad App for the Matrox processor allows easy display configuration and managing content displayed on the video wall. As an addition, for live feed content, we’ve installed a HD camera on the rooftop to show the London skyline. Using the Matrox system plus multiple sources (up to 14) enables us to display a single image across all screens or multiple images/videos across all screens and even live feeds from the rooftop camera. Additionally, a live TfL feed shows the current Tube information. Transition between the different contents is managed very easily with an iPad App. 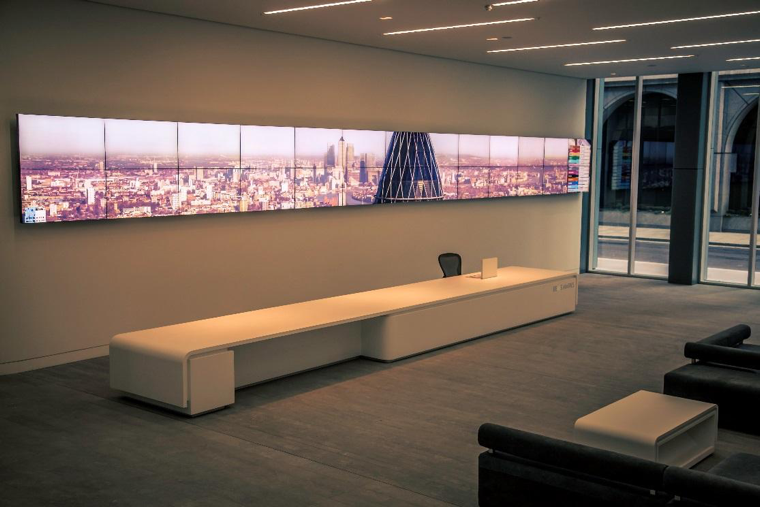 Entering “6 Bevis Marks” and being confronted with a 15m long video wall in reception (the longest in town), automatically catches the attention of visitors. 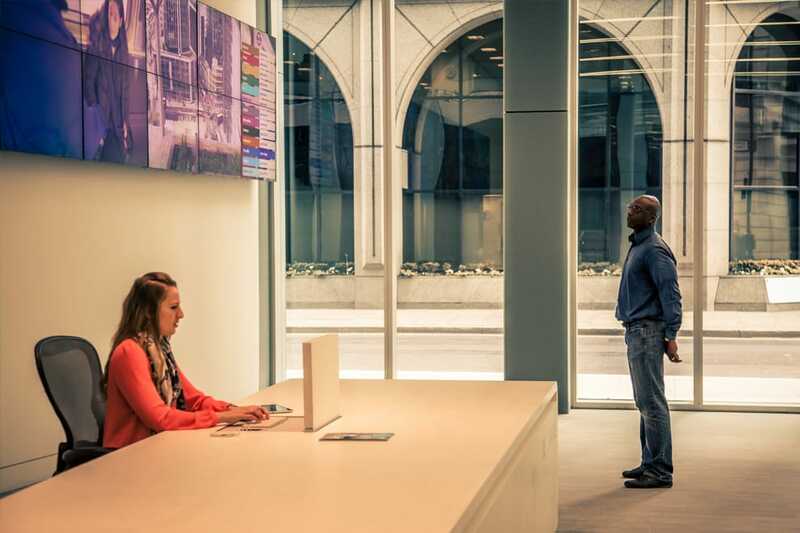 Showing live feeds from the rooftop camera, videos and stills give the tenants the opportunity to use this video wall for diverse marketing, event and/or artistic purposes. People can be entertained and informed at the same time and get the impression that the building and the companies within are up to date and are digitally savvy.